I had the privilege of meeting Ralph when Tickety Boo Press hired me to edit his already Amazon bestselling book, Endeavour, for a rerelease. He was a pleasure to work with and to read, and if you have the opportunity to do either, I suggest you take it! 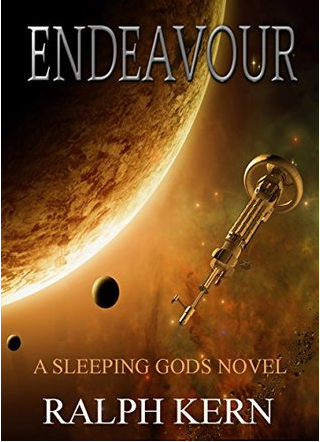 Endeavor has been compared to A.C. Clarke’s Childhood’s End & is currently on three Amazon Top-100 lists. Very early on in my career, having ruined several friends’ and families’ meals in restaurants with an honest answer to that question, I realized that what they’re actually asking is “What’s the most PG13 grossest thing you’ve ever seen?” or even better, I just give them some amusing anecdote involving the dubious, and sometimes downright perplexing, behavior of people on the lower end of the social spectrum. As for the weird stuff—well sometimes I struggle to believe my own memory about what I’ve seen people get up to, let alone having to listen to someone else tell a story about it. Basically, people don’t want the truth…they want a sanitized version of events. This brings me neatly onto the thrust of this post. Several years ago, I started writing. No particular reason for it other than a New Year’s resolution. I had a story idea and basically thought “why not?” So I started laying down my novel, Endeavour, which is a sci-fi piece bearing no relation to my career. While that was ticking away though, I decided to try my hand at a number of short stories, partly to get my skills and drills up to scratch and partly because, as many writers undoubtedly find, a change is as good as a rest sometimes; writing shorts can be a constructive break from tapping away on your main work. One of these short stories involved a pair of cops driving to a job. Now, to add a bit of context, I’m a member of an online SF/F community where critiques can be posted, and I thought I’d put up some sections for feedback. I hadn’t told anyone I was a police officer. Anyway, back to my two cops. They get their next job over the radio, so one of them pulls out his phone (when the screen lights up, it shows a picture of his family) and puts in the address, bemoaning the fact that he only has a little power left. With that, they start driving to it. Ahh, perfect opportunity to do a bit of character building! I thought. So while on route, they begin talking about a bit of personal stuff. All in all, that short passage summed up how we really go to jobs. One of us enters the address into the phone to nav it while the other activates the blues and two tones, and we set off. Then we undoubtedly catch up on gossip. Me: So, Bob. How’d that hot date go? Cue a probably sordid tale with a variety of anatomically unlikely scenarios involved. The critiquers slaughtered me! “Police would have sat-navs fitted into their cars,” they cried. “They would never be so unprofessional as to talk about personal matters on their way to a burglary,” they bemoaned. Well, unfortunately, Her Majesty hasn’t seen fit to equip our cars with sat-navs, leaving us with trusty google maps. The other day, I held an in-depth conversation about what I had for dinner the previous night on the way to deal with an axe-wielding maniac. Why? Because when it’s your tenth job of the day you tend to get a bit bored with growling at each other in the melodramatic fashion that’s shown on TV. Another person was asking for “reasons a mother would leave a baby.” An emotive subject, perhaps. The standard response from many people was “a mother would never leave her child, maternal instincts, etc., etc. I made one brief attempts to relay some of the reasons I’d come across at work—the malicious, the nasty, or the just plain old very bad parenting. Needless to say, it’s not a discussion I’ll get involved in again any time soon. I learned very quickly that the truth about jobs like the police (a role that by its very nature, tends to make for some entertaining tales) is that people are not really interested in the truth. They want the media version: Cops don’t talk to each other, they growl and bicker. Blue-light runs are exciting car chases, not the calm collected and most of all safe journey that they actually are. When people are shot, bullets leave neat little holes. When they’re in a car crash, the victim’s insides are where they should be—inside. No one soils themselves when they die. Fights are neat kung-fuesque-type affairs, not rolling around on the ground in the dirt and worse. And so on and so forth. Is that my limitation as a writer—that I can’t write the truth convincingly? Maybe, but then it seems like I share the same failings as ninety-five percent of police fiction writers in that regards. You know what? I think that this holds true across the spectrum of jobs that people seem to like writing about, and more importantly, like reading about. People often just want to hear that a knight is a paragon of honor and virtue. Not that he’s been in his armor for the last three months and smells like a hobos underpants. Astronauts never swear. (Geek moment, Pete Conrad, one of the men who walked on the moon, was borderline Tourette’s!) Secret agents never suffer from impotence and so on. The moral of this post is, even with the best will in the world, sometimes you have to make things generally readable and relatable to a wider audience for them to enjoy it. And maybe, just maybe, sometimes the truth is too strange for fiction. An updated version of Endeavor will be released by Tickety Boo Press and available in spring of 1015 on Amazon.